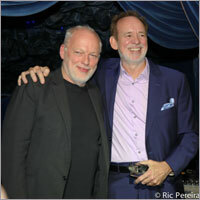 David Gilmour recently presented his friend and bandmate Phil Manzanera with a Lifetime Achievement Award at the Latin-UK Awards (LUKAS), for his contribution to British music. Phil was honoured at the LUKAS Gala Ceremony on March 18th, at London’s Café de Paris, which recognised his commitment to Latin American musical styles. Phil, who is half-Colombian, first picked up the guitar at the age of six while living in Cuba and has since incorporated many Latin influences into his music. His 2010 album Corroncho, featuring Colombian artist Lucho Brieva, mixed pop and ballads with cumbia and salsa. The gala ceremony was hosted by Spain’s most popular TV presenter, Boris Izaguirre, who oversaw awards to winners of 50 categories in Entertainment, Business and Community, selected from 1,200 nominees by the voting public, who cast more than 330,000 votes over three months. The evening saw performances from some of the UK’s finest performers of Tango, Salsa, Ballet, Brazilian music and dance, including current Royal Ballet star, Colombian Fernando Montaño, the renowned Tango artist Martin Alvarado, and many others. The awards programme is expected to be broadcast on public TV stations in Spain and across Latin America (including RTVE Spain, RCN Colombia), and is said to reach over a million people around the globe. The Air Europa Latin-UK Awards is the only awards ceremony to recognise the contribution of Britain’s one million Latin American, Spanish and Portuguese residents. know that I’m about a month behind, but just read(on the Suede website) that you have and are linking up with Gaz Coombes, Mat Osman and Mike Joyce. This seems great - will you post any news on this site, please. Best. J.
Phil, great seeing you at Stuarts in Phuket and many congrats on this award. ! ExpressionRecords.com powered by:WordPress and Tubemap queries. 0.085 seconds.